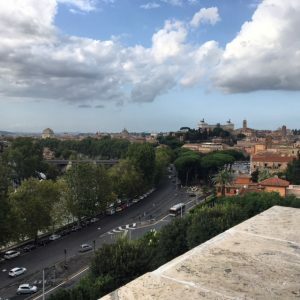 We caught up with SAI Rome Assistant Program Coordinator Alessandra, who talks about a weekend in the Eternal City. Move to Rome in the summer, when the heat almost splits the sidewalks open. Move to Rome without knowing which buses, trams or metros to take. Move to Rome and be confronted with hoards of tourist every single day. Move to Rome and get lost a hundred times in your first week—be stubborn, don’t use Google Maps. Ok, maybe use Google Maps, but be subtle. Move to Rome and watch the sunset over Circo Massimo on your second night. 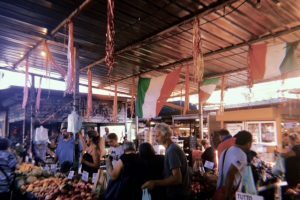 Move to Rome and become a regular at a local restaurant in your first week—unashamedly devouring a giant plate of amatriciana, surrounded by couples and families. Move to Rome and be starstruck at the sight of Saint Peter’s Basilica, only to have to jump out of the way of a honking scooter. One of the first people I met after I moved to Rome over four months ago told me: “Roma… o la odi, o la ami, ma ti conviene proprio amarla”. Rome: you may love or hate it, but it’s much easier to love it. Most Romans and residents of the eternal city have an almost comical love/hate relationship with it. 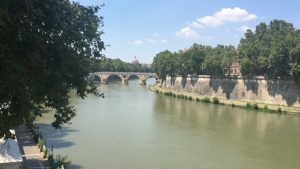 I’ve heard many taxi drivers complain about traffic, then tell me again and again how Rome is the most beautiful city in the world as we inevitably drive past a monument, or the light hits the river or a building just so. Yes, Rome is stunning, but I find that in this overwhelming, seemingly limitless city, the greatest moments of beauty come from the unexpected. Saturday morning: wake up, have a cappuccino and a cornetto at your local ‘bar’, or café, head to a mercato rionale—a neighborhood market, to get your grocery shopping done for the week. The one closest to me is the San Giovanni di Dio market. 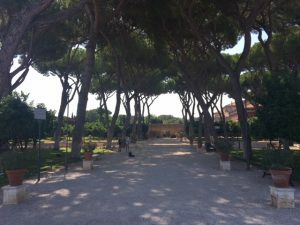 Saturday afternoon: head to the ‘Giardino degli Aranci’, or Orange Garden, for an amazing view of Rome and great people watching opportunities. Yes, it will be crowded, but also filled with newlyweds taking their wedding pictures and friends lazing in the grass, fully embracing the concept of ‘dolce far niente’. Watch the sun set over the Italian capital, and likely listen to a street musician struggle through a Bob Dylan song. 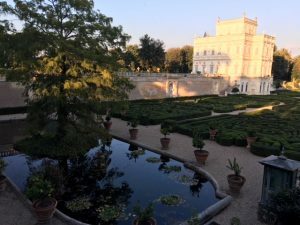 Sunday morning: sleep in, prepare a picnic from all the fresh products you brought at the market and head to one of Rome’s many parks—conveniently, Villa Pamphili is just by my house. Walk between the rows of Rome’s famous stone pine trees, head to the Villino Algardi with it’s perfectly manicured hedges and 17th century architecture. Sunday afternoon: See one of Rome’s less visited museums. Happily, on the first Sunday of the month, entrances to all national/public museums are free. My favorite is Centrale Montemartini in Ostiense—this often-overlooked gem is frequently empty, so you can stroll around at your leisure. 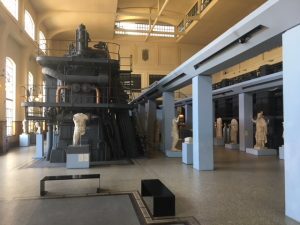 It embodies Rome perfectly: it represents both the ancient and the modern—this museum is an old power plant that now houses hundreds of Greek and Roman statues, as well as beautiful mosaics. Sunday night: In order to prepare for the week ahead, Sunday night pizza is a must. 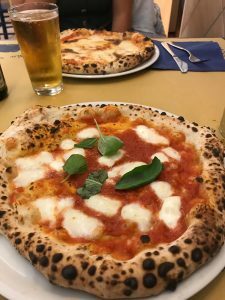 My favorite is La Gatta Mangiona in Monteverde: the décor is kitch, but the pizza is simple. Go for the classic: margherita with mozzarella di bufala—you won’t be disappointed. Yes, Rome may be frustrating at times, but there is no shortage of beauty here—and, yes, it is possible to find tranquility and a lovely weekend routine.